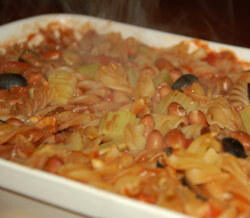 This convenient pasta bake recipe makes use of the borlotti beans popular in the Italian region of Tuscanny. If you are unable to find borlotti beans in your local store you can substitute with cannellini beans. 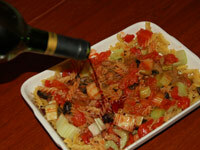 A heathly vegetarian meal that takes only 5 minutes preparation work, then you can relax whilst it cooks itself. 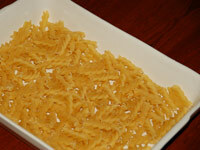 Put the pasta in the base of an oven proof dish. 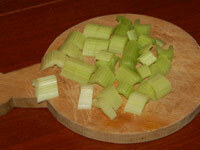 Chop the celery and add it to the dish along with the tomatoes, olives, beans, herbs, stock cube and salt. Gently mix all the ingredients together with a large spoon being careful not to damage the beans. Add the wine and briefly mix it in. Top up the dish with water until the liquid almost but not quite covers the pasta. Cover the dish with aluminum foil and bake in a preheated oven at 190°C/380°F/Gas Mark 5. Cook for 25 minutes then stir the contents of the dish before putting it back in the over for a further 20 minutes. 5 minutes before the cooking finishes remove the foil to give the pasta a golden brown finish. Who needs diet pills or appetite suppressants? Lose weight the healthy way with the low GI diet!